BRASILIA: Brazil said Friday it is mobilising 157,000 soldiers and police to ensure security during the World Cup, which opens in 20 days against a backdrop of violent protests and strikes. The ministry has invested 709 million reais (US$322 million) since 2012 in modernizing its forces and preparing them for the tournament, which runs from June 12 to July 13. Those protests drew a million people into the street and turned violent at times, embarrassing the tournament's organizers. "Our feeling is that (the protests) will be smaller than the ones last June. But, sincerely speaking, we are prepared for any situation," Cardozo told journalists at a joint press conference with Defense Minister Celso Amorim. The protesters are angry over the more than US$11 billion being spent to host the World Cup in a country with glaring inequality and pressing needs in education, health care, housing and transport. The military will also work with police to secure the enormous South American country's 16,800 kilometers of borders. The anti-World Cup protests have shrunk in numbers since last year, but have also grown more radical. 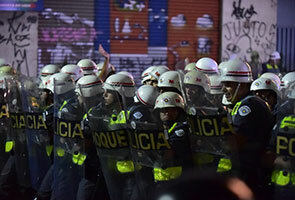 As the tournament approaches, a series of police strikes -- plus the threat of a nationwide strike by federal police -- have also raised concerns about security in a country with one of the world's worst crime rates.